Oddly reminiscent of a battleship, the New Sky Building No.3 stands out amongst the many grey-hued generic mid-rises in Shinjuku, Tokyo. Designed by the idiosyncratic architect Yoji Watanabe (read this fascinating Metropolis article about him), this 14-storey building was completed in 1972 at the height of the Japanese metabolist movement. Yet the New Sky Building should not be standing today. Slated to be torn down, it was instead restored from a state of semi-abandonment in 2010. Today it provides homes and workplaces for many Japanese creative types. In comparison, the Nagakin capsule tower, a true icon of metabolist architecture, faces a more uncertain fate. Plans for its demolition appear to be on track despite the efforts of the architectural community to save it (read this New York Times article about it). So what lessons can we draw from these two examples with regards to designing architecture that lasts? The metabolists considered the rapid transformation of Japanese cities to be an unavoidable reality. Consequently, change and temporality were underlying themes in many of the architectural scenarios that they developed. The Nagakin Capsule Tower was the built manifestation of one such concept – the unicore typology. While Yoji Watanabe was not part of the metabolist group, his New Sky Building shares a similar design parti with the Nagakin Tower – modular capsules are affixed to a main circulation core. While the core remained a permanent structure, the continual replacement of capsules was, at the very least, an implicit idea. However there are notable differences between the two buildings, which may have contributed to their eventual adaptability or lack thereof. First, the basic living unit in the Nagakin tower was a single capsule. In comparison, several capsules make up a living unit in the Blue Sky building - 4 such apartments occupy every level. With its small interior size, each capsule in the Nagakin Tower was limited to use as a single person residence (the prototypical salaryman). The larger sized units in the New Sky Building though, could accommodate different modes of living and other programs, thus broadening its appeal to a wider range of people. In fact, the occupant of one of these apartments told us that it was now a converted shop for computer gamers. While exploring the New Sky Building, we discovered several spaces where people could meet - corridors for chance encounters, a ground floor lobby with an atelier to the side, a shared 'workhop' on the second level and a rooftop that doubles up as an impromptu party venue. In contrast, the parsimony exhibited in the design of each Nagakin capule, where no space is wasted, seems to extend to the entire building - very little of its floor area is unprogrammed or dedicated to non-private use. Residents appear to lead hermetic existences within their individual capsules, sealed off from one another. The question arises: does the provision of communal spaces contribute to a collective sense of ownership, and thus increase the likelihood of residents taking active roles in their building's preservation? Of course, architectural merit is not the only factor that determines a building's longevity, oftentimes it is economics that plays the crucial role. 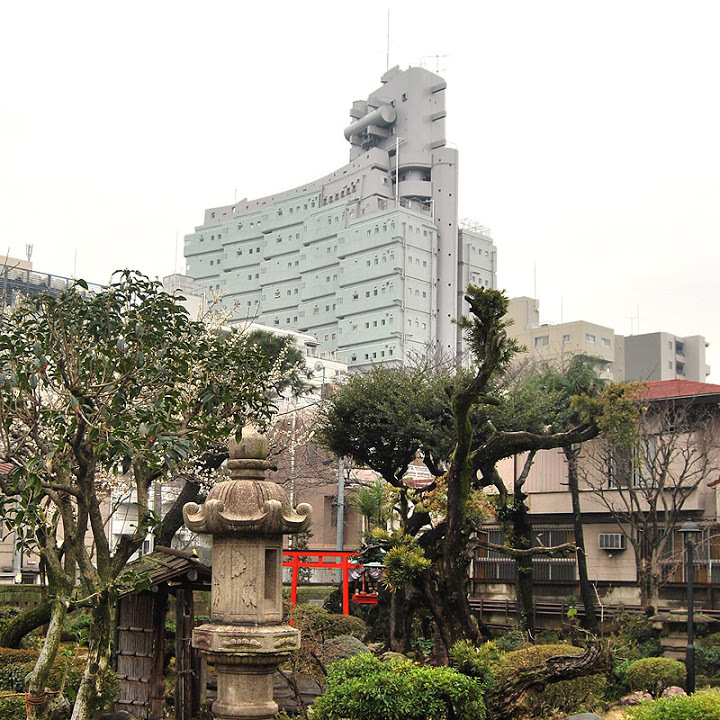 Today the Nagakin Capsule tower sits on valuable real estate worth many times more than at the time of its construction. In this reality, developers are proposing higher density buildings in its place to increase economic returns. At the same time, the New Sky building was rescued from demolition because its new landlord recognized a commercial opportunity in converting it into apartments and offices, catering to both Japanese and foreigners. The issue of temporality and adaptation has always been a topic of interest in architecture, and has been taken up and explored by other practitioners/theorists such as Cedric Price and John Habraken. With the accelerating rate of urbanization, architects today are confronted with rapidly transforming cities, much like the metabolists did in the 70s. Should new architectural strategies be developed? Longer lasting buildings or more ephemeral ones? Should architects take a closer look at economics instead of being dismissive about it? As these questions are posed, is it worth revisiting the metabolist experiments of the past to look at what worked and did not?